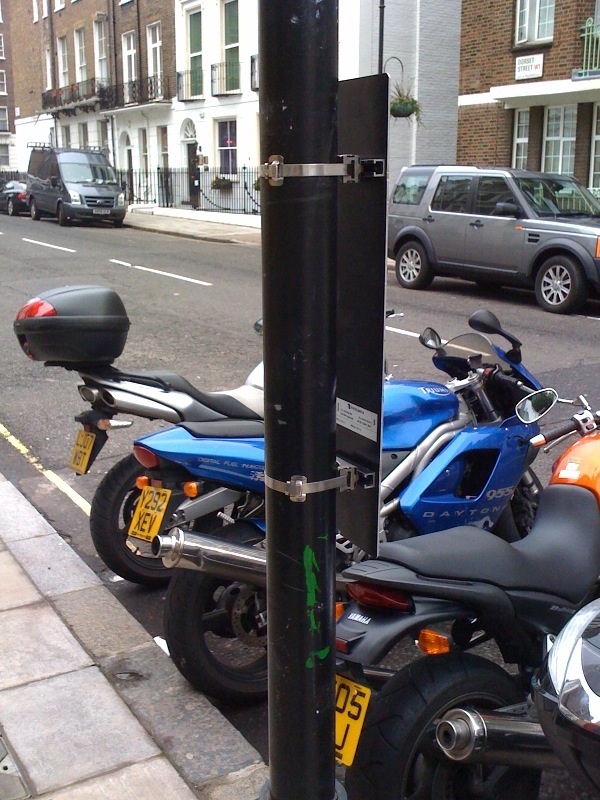 Is Westminster Council getting short of bike parking signs? 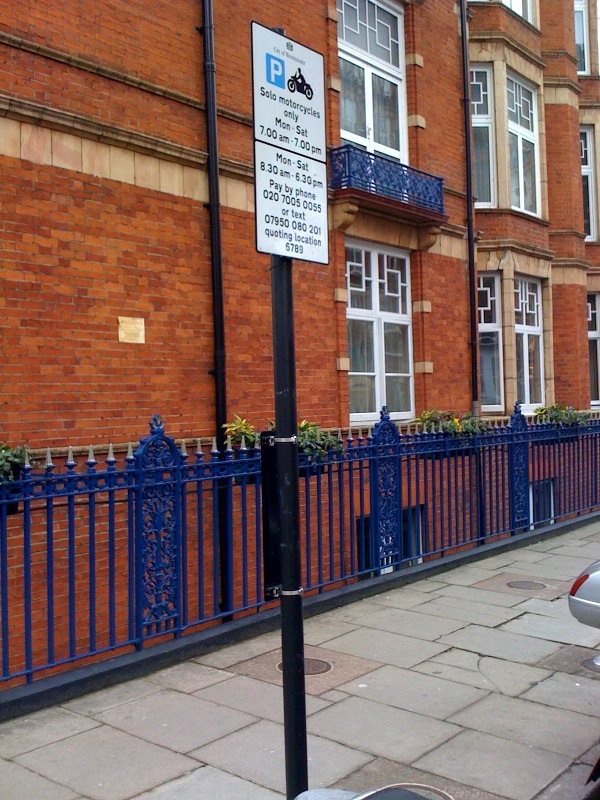 As many of our readers will know, the vast majority of the motorcycle parking signs in Westminster have been “upgraded” in the last couple of weeks (see photo on the right) by a group of unknown citizens, angry at Councillor Danny Chalkley, who has recently decided to stealth tax bikers for parking on a permanent basis, despite the thousands of objections he received during the experimental phase of his ludicrous motorcycle charging scheme. While riding and walking in the streets of Westminster at lunch time today, we noticed that quite a few bike parking signs had been replaced or cleaned over the weekend, thus increasing the amount of taxpayers’ money spent on an unwanted scheme, instead of investing the same money in slightly more productive ways. We can be sure that Councillor Angela Harvey’s favourite “little old ladies” would have preferred to see their money spent on improving their safety, as she suggested, rather than on parking signs which will, without a doubt, be defaced again in the near future. Anyway, we must say that we really had a good laugh not only when we noticed that the vast majority of the motorcycle parking bays we saw today had their signs cleaned or replaced by a Tory Council desparate to make the shareholders and employees of their pay-by-phone system provider, Verrus UK Limited, wealthier but also, when we noticed that the same bays were all missing one of the two lower signs, where instructions on how to pay the bike parking tax are normally shown. 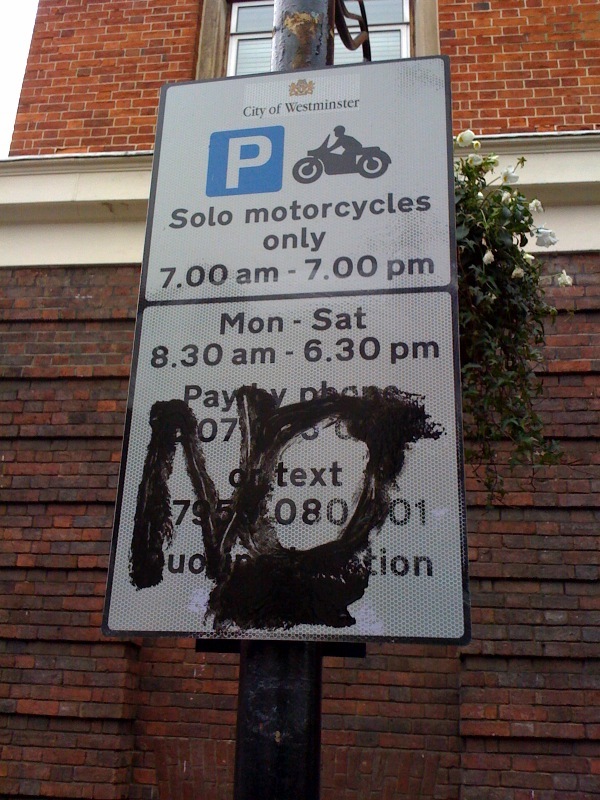 Does this mean that Westminster Council has decided to clean or replace only half of the lower defaced bike parking signs, in order to restore the parking tax as quickly as possible and save precious time and costs to serve the shareholders and employees of Verrus, rather than their own residents and little old ladies? Could it also mean that they are running out of motorcycle signs, thus have decided to just display one lower sign per bay in order to maximise the number of bays where the tax may be enforced? 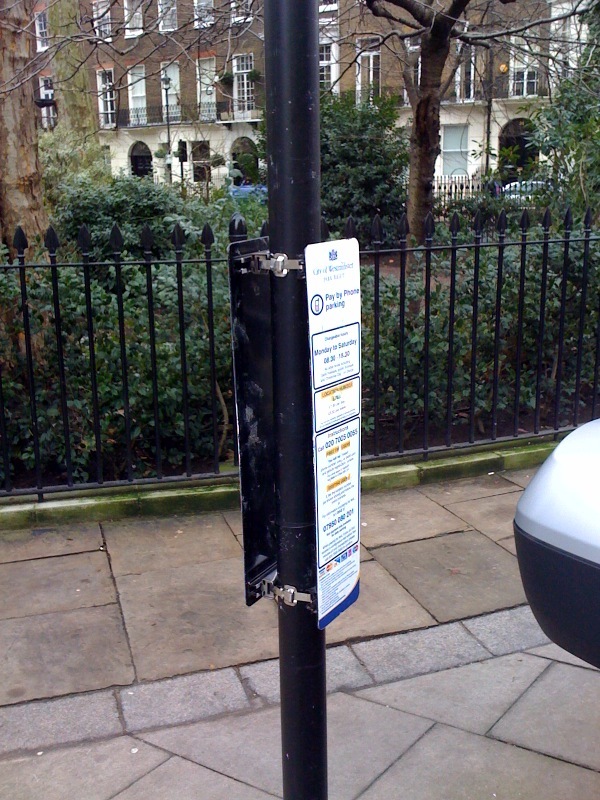 Or would we dare to believe that angry citizens have removed parking signs in a view to making the tax unenforceable? 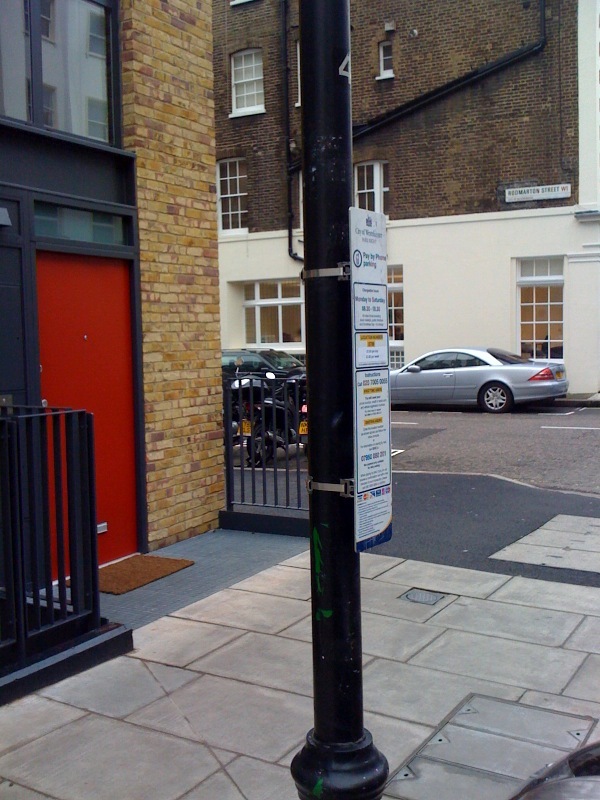 We just don’t know, but whatever has been going on, it would perhaps be a good idea, if your bike is issued with a PCN in a bay where one of the lower signs is missing, to request (by way of Freedom of Information if necessary) the Traffic Management Order (TMO) for the street or road where the bay is located. 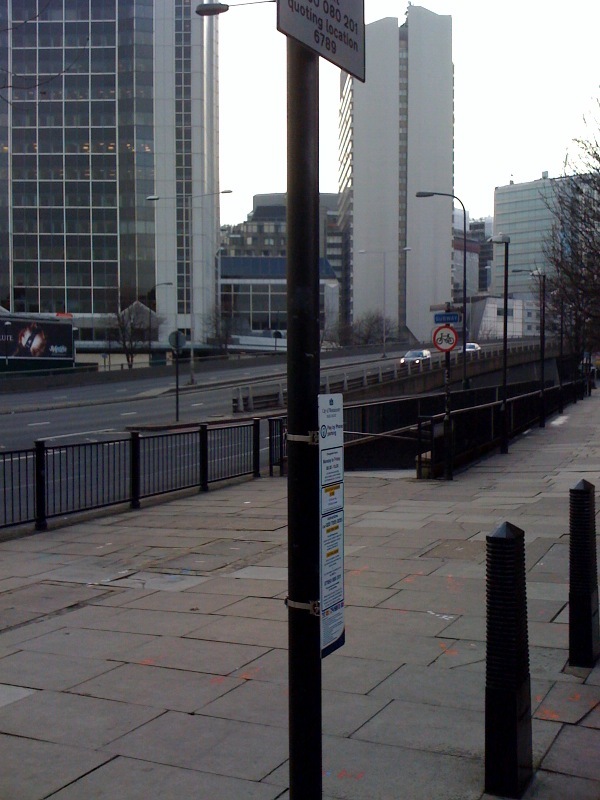 If the parking signs displayed in the bay (or any other details) are not exactly as described in the TMO, then your PCN may be invalid and possibly cancelled, should you challenge it. It could be further argued that since car parking bays are equipped with two lower signs, then why not the motorcycle ones, which used to? This is just a suggestion and does not mean that your PCN will be cancelled, but it might be worth giving it a try. Since we have today seen a fair proportion of motorcycle parking bays equipped with only one lower sign rather than the usual two, we can only assume that quite a few motorcyclists will try and get their PCN cancelled in the next few days, which may inevitably generate a lot of administration work for Mr Chalkley’s parking department! Good luck to all and let us know how you got on!